It's nearly lunchtime at the Daily Mail newsdesk. "I've just accepted Fred and Wilma's friend request on Fiercebook." "YES MADAM, I KNOW I'M SHOUTING, BUT I HAVE TO LEAVE THE CAPS LOCK ON BECAUSE I CAN'T USE THE SHIFT KEY AND TYPE AT THE SAME TIME BECAUSE OF THESE TINY LITTLE ARMS." When Dinosaurs Schooled the Earth. "You know if the boss says 'Clever girl' to me ,one more time. Am going to bite his friggin face off." ...and that's why it's called Thesaurus.com. So David Icke was right after all. "How do I clear my internet prehistory?" "Guys, are any of you getting a popup about 'saying the magic word'?" Well what did you expect? 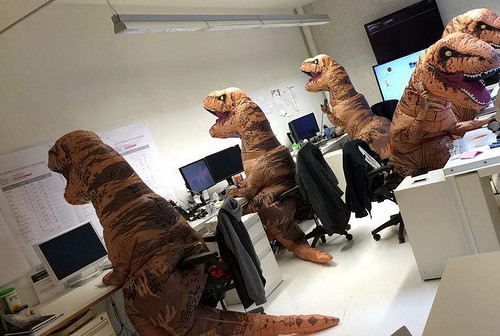 You said most of our IT went out with the dinosaurs. We buy any carnivore call centre. Cyber Attacks: Kremlin sends West proof of Russian innocence. They will become birds. Partly through evolution, partly for a laugh in a chatroom. "Look they're telling all our old jokes on caption.me." Bill: "Once you get it on, it's better than sending a telegram, Sam. You'll feel like a metal guru in no time. A 20th century boy!" Sam: "You won't fool the children of the revolution." "Hey Rex,you know that big fella from upstairs has just won an award for never being late in 20 years." "That's because he's a prontosaurus." "It's your turn to make the Tea Rex." "Is it Big Macs and Microchips all round for lunch then?" You don't have to be bad to work here, but it helps. There was us on Facebook.